Made in Hong Kong, my baby still hums like the day it was born. 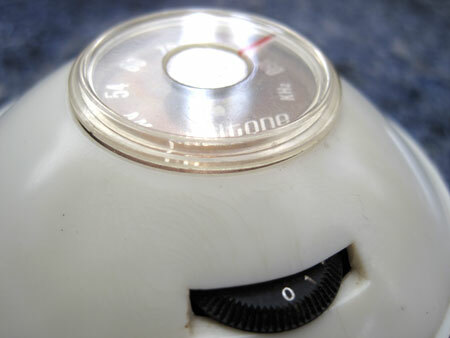 Turn the plastic thumbwheel and music blasts through the portals on the bottom as though the soundwaves could have propelled this spacecraft right off the kidney shaped coffee table it most likely sat on. 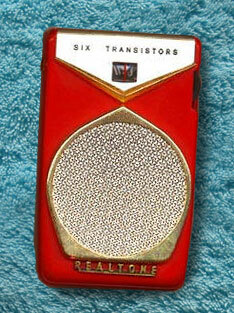 I love actual owls and ladybugs but none so much as these transistorized versions. 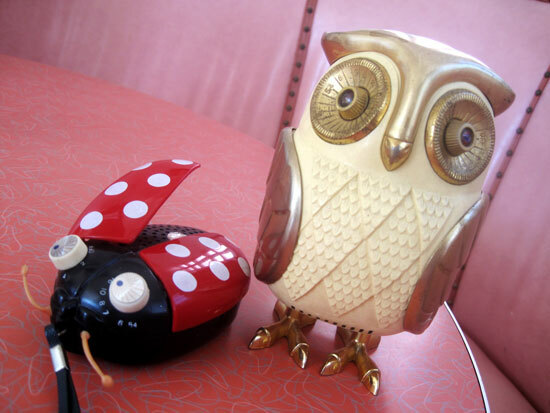 I have entire zoos and forests of these things but these are two of my favorites – a ladybug who, when you twist her left eyeball, opens her wing to expose a still working speaker and an owl who, when you twist her right pink rhinestone eyeball, chirps the sound of AM radio as clear as the day she was hatched. I bought the owl in the early ’80s and she still works perfectly despite the fact that I’ve never changed her batteries. The ladybug, all plastic and made in Hong Kong by Sonnet, British Design, is 5 inches long and an inch and a half tall and counting. She comes with a convenient wrist strap and two rubber antennae. The owl, made in Japan, is 8 inches tall and fat with a plastic body and gold medal wings, eyes, legs and speaker holes in the crotch. 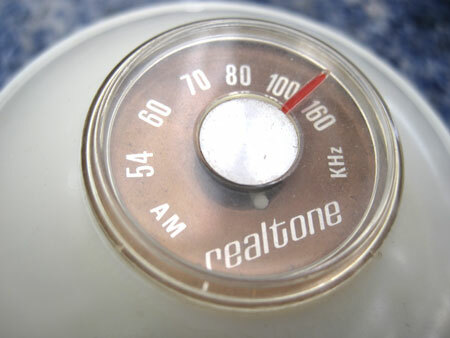 Although the ice cream looks more like dry wall spackle this radio, made in 1977, still plays beautiful static-y music like the day it was born. 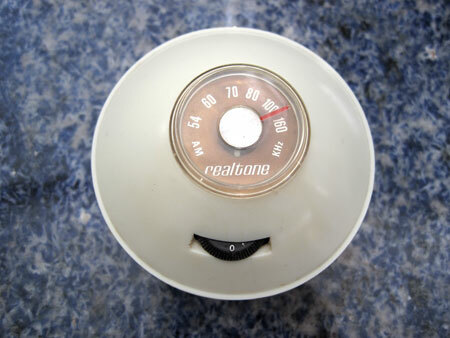 Made by Amico, the only sign of decay is the color of the ice cream itself which has faded from the purrfect strawberry pink on the inner side of the plastic to a dull brown rum raisin outside. 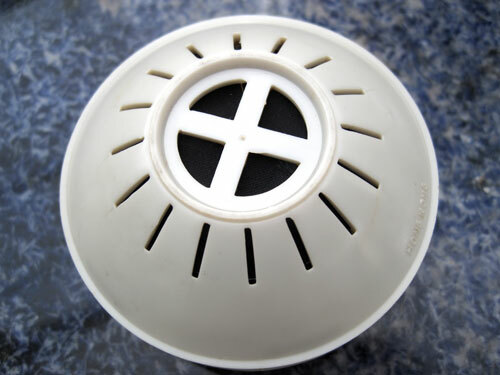 The cone pulls out of the base so you can walk around pretending you’re eating it, a fun activity for some back in the day, especially those on roller skates. 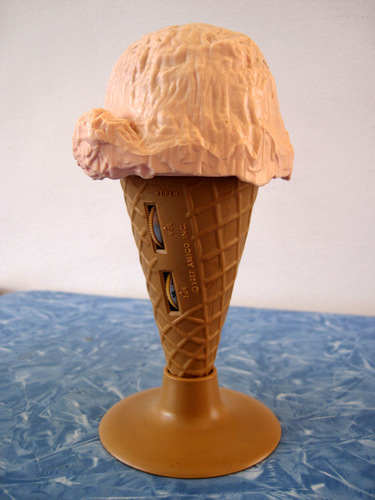 I remember thinking that there should be bases for real ice cream cones so people like me who licked slow to drag out the ecstasy of my favorite Pralines ‘n Cream wouldn’t have it dripping all over their hands. 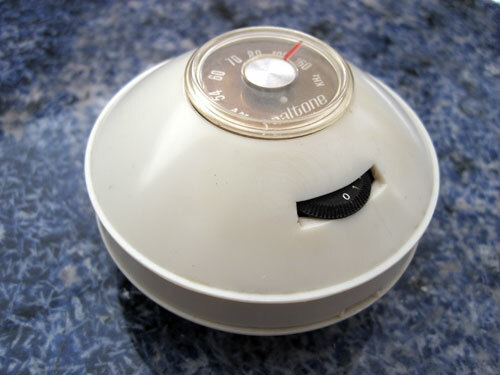 This is still my emergency radio in case of earthquakes. 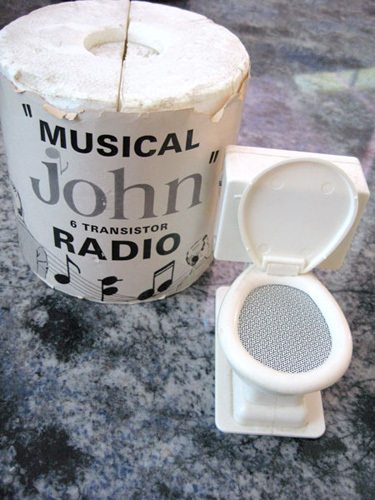 How did a toilet come to be one of the most popular transistor radio designs in the 1960′s and 70′s? This one, made in 1967 by H. Fishlove & Co. (not kidding about the name) is especially noteworthy because of the packaging, a styrofoam toilet paper roll that says ‘go-go “canned music”‘ on the back. Go-go indeed.